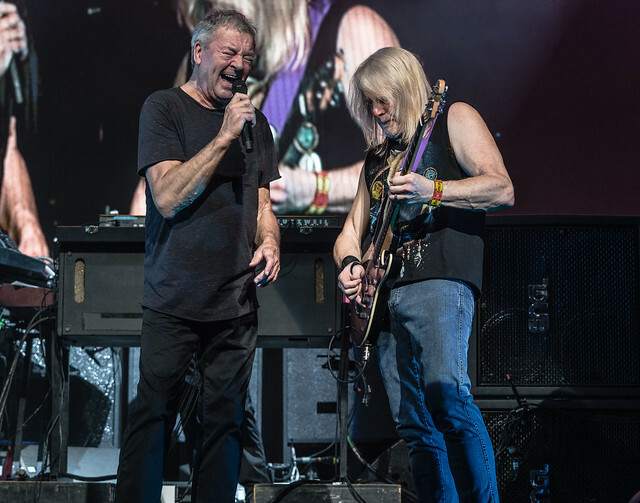 Deep Purple and Judas Priest 50 Years of Rock History at PNC Reviewed by Jimmy Warsham on September 14, 2018 . When you are looking to put a hard rock tour together and want to bring in a couple of the biggest names ever together, there are a few bands that just make sense. Case in point: Deep Purple and Judas Priest. Who would have thought that these two bands would be still on the road after 50 years of making music? Well, they are, and their music is still as relevant as it always was. 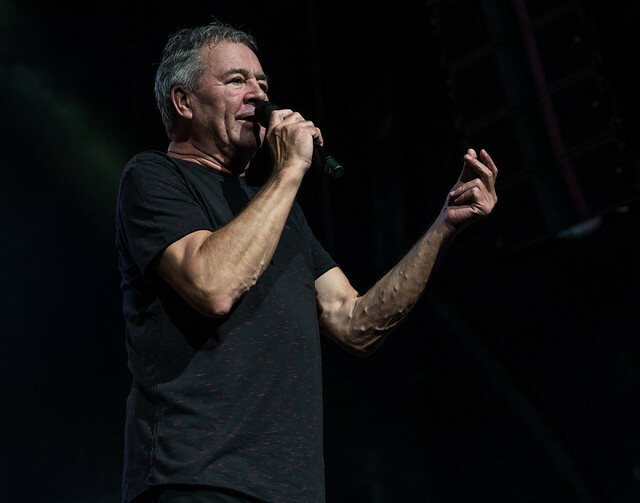 Charlotte was lucky enough to witness the co-headlining tour as they stopped by the Queen City ahead of the looming hurricane that is threatening the area. 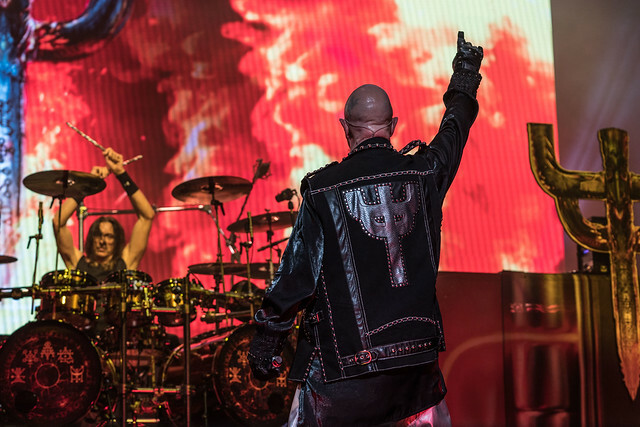 The bands brought their own storm of hard rock and heavy metal to the fans who braved the apocalyptical weather forecasts that could have been a part of the lyrics for one of Halford’s songs. 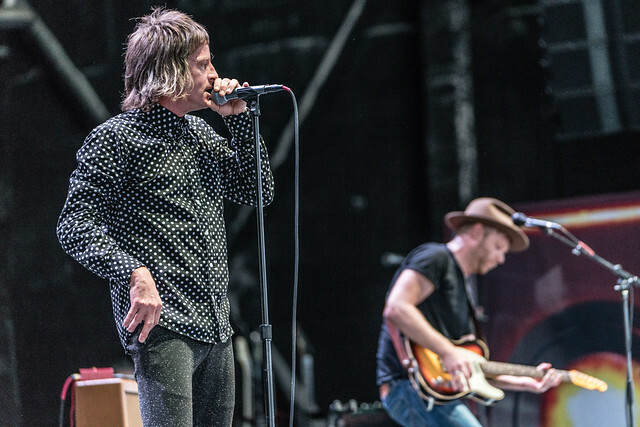 Opening up for the two hard rock juggernauts was the British bluesy rock band The Temperance Movement. Straight ahead blues rock is what they are all about. They came on stage, picked up their instruments, and jumped right into their songs. With a stripped down set, the five guys came out and rocked the house. Phil Campbell’s vocal style and stage performance is reminiscent of some other British front men. He definitely had some moves like Jagger and the chops to back it up as well. 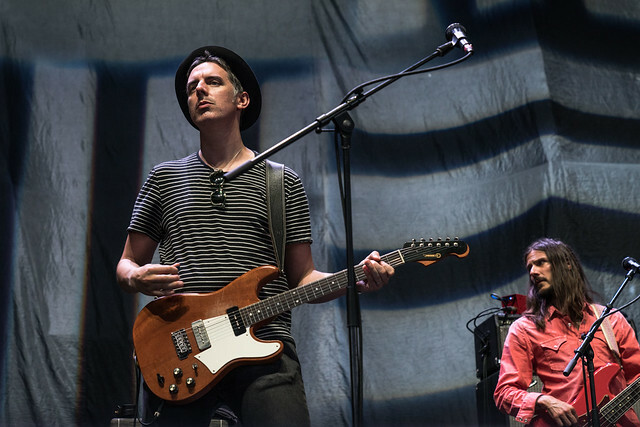 The band was tight and did a great job getting the crowd hyped up for the main event, and they were named at the Scottish Music Awards as “The Best Rock Band”. They showed why they picked up this honor as the lightning danced across the sky behind the crowd. One thing I have noticed is if you want to get the crowd up and singing along at a metal show, play “War Pigs”. Priest played the epic song as an intro and just like Pavlov’s experiments show us, the crowd reacted and were up singing at the top of their lungs. 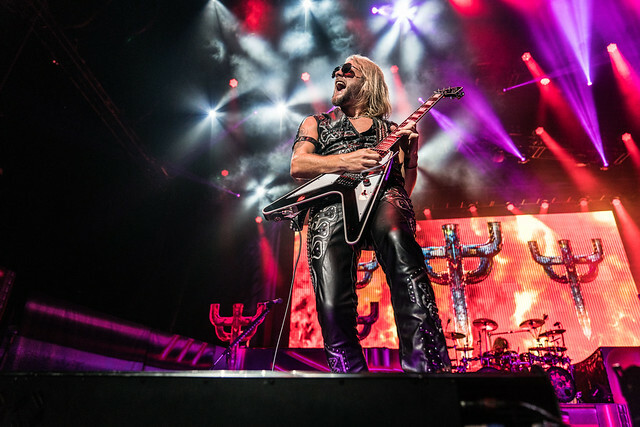 Judas Priest has always had some very cool lighting and stage shows over the years. This year was no different. They even started off the show with what I will call a magic curtain. Why magic? Well because there you see it, there you don’t. Most curtains usually drop or pull, this one did a combination of both. The curtain literally just disappeared into a black hole on the side of the drum riser. I am not sure what kind of spring-loaded cable they had, but it was a great way to get the curtain out of the way fast and kick off the show. 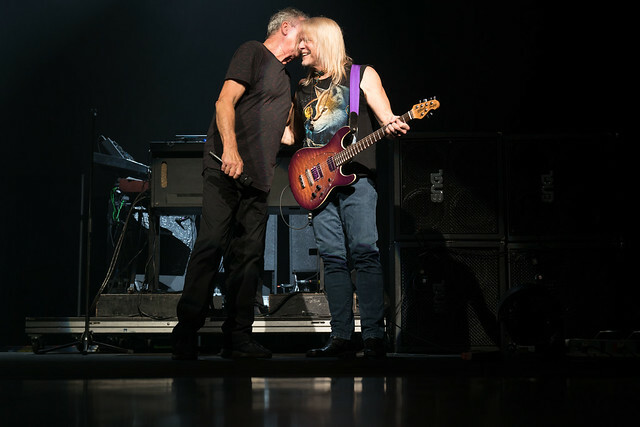 As fast as the curtain was gone, the band was on stage and that classic two guitar sound filed the pavilion. The fists were up and the show was on. Now having seen the guys in the heyday of Heavy Metal, it was a little different seeing the current lineup playing some of my favorite songs. With the departure of K.K. 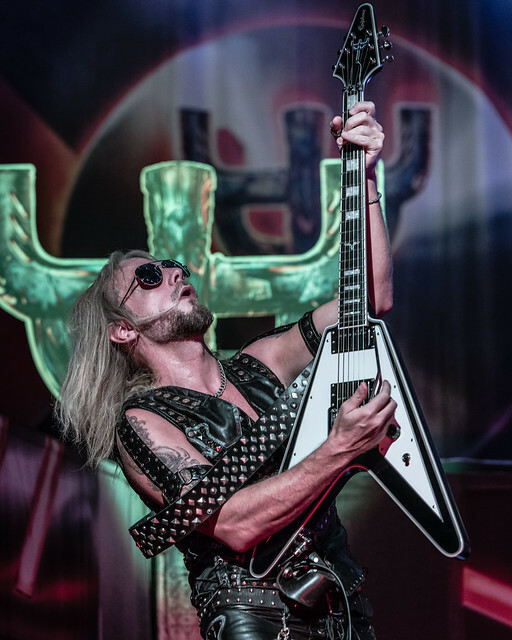 a few years ago, and the health issues that have impacted Glenn Tipton’s ability to tour and play everyday, Rob was able to compile some great guys to step in and keep the music alive. It is easy to see similarities of the K.K. mold when you see Richie Faulkner with his Flying V and flowing gold locks. Richie has become a fan favorite and he engaged with the crowd all night long encouraging their participation. 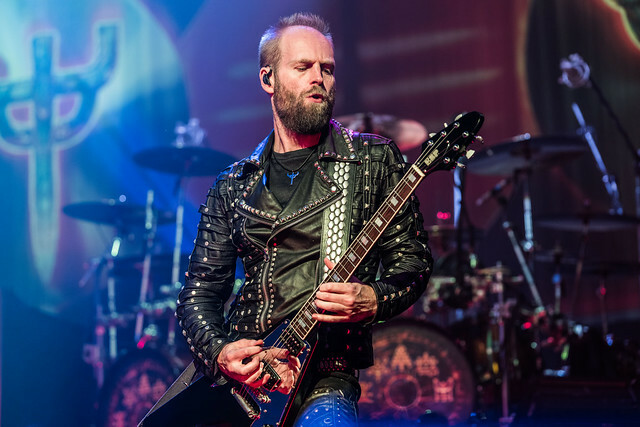 Grammy winning producer and musician, Andy Sneap is also on the road standing in for Tipton during his absence and does an amazing job holding down the guitar sound on stage left. I understand that for shows, Glenn might make an appearance when he is feeling well enough to do so. 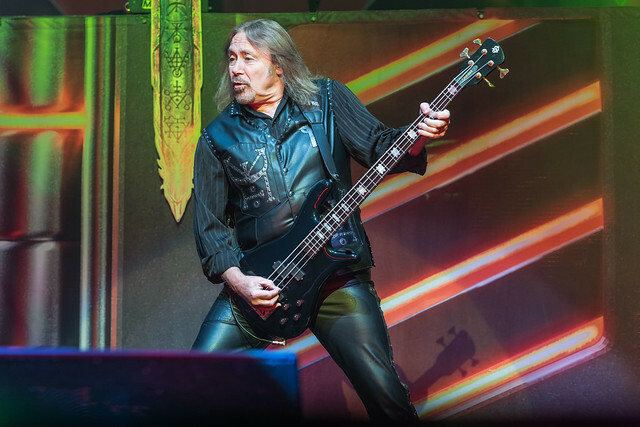 Since the beginning of the band’s history, Ian Hill has been in control of that bass line with the band. He doesn’t look like he aged a bit as he banged on his 4 stringer and is is still tight in the pocket. Scott Travis has been around long enough now that he is part of the band also. Perfect time and keeping the rhythm for the band, he was holding things together as the guitars drove the melody along. They have a talented group of guys that blend the old with the new. 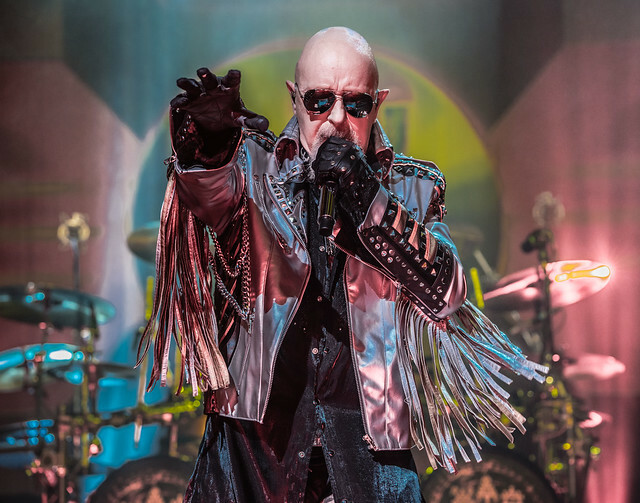 What can anyone say about Rob Halford, other than he is and always will be the Metal God? Nothing else needs to be said. 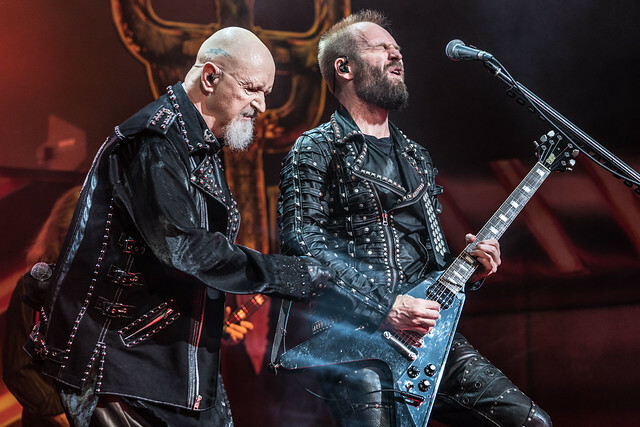 Halford still is donning his leather and sported some chaps for the crowd. If the wind blew his jacket the right way, you got to see a little more of Rob than you may have expected. His pants were well ventilated. The voice is still there. I believe the guys may have down-tuned a little bit to really allow him to get the most from his voice, but he sounded great. The one thing I found somewhat odd was that he spent a lot of time center stage, intently singing eyes and face down. He spent a lot of time in that center spot and didn’t really engage the fans early on as much as I had expected. 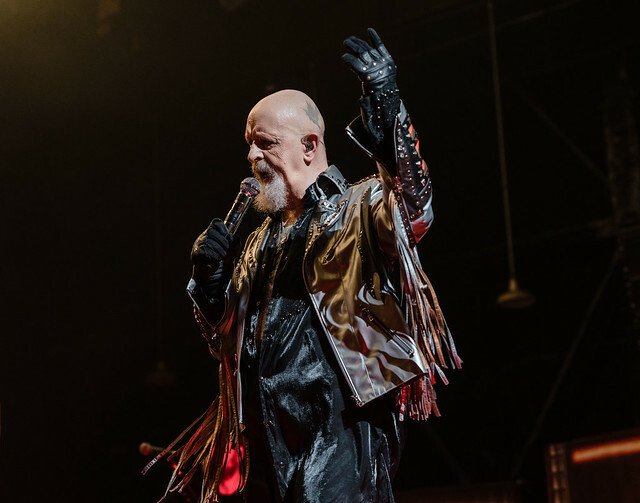 As the show went on, he did get out and make sure to make that eye contact that the fans love, especially when singing the classic “You’ve Got Another Thing Coming”. Seeing him in his element singing that song took me back to the 80’s, also known as the good ole days. Rob is one of the all time greats, and I don’t think you could find anyone in the industry who does not have the utmost respect for him. He is my all time favorite, and it was an honor being up close and personal seeing him perform. 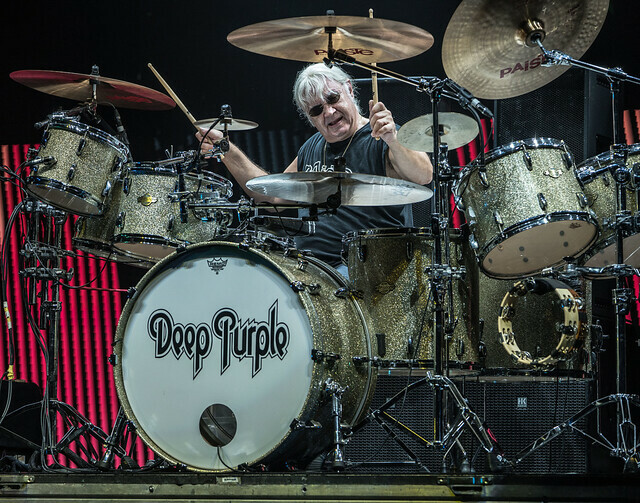 Deep Purple is a band that I didn’t really follow over the years, but is a band that has influenced anyone who has ever picked up a guitar. For a lot of people, “Smoke on the Water” is that first song that has hooked the young guitar players into playing. When you are part of the unholy trinity of British Rock alongside Led Zeppelin and Black Sabbath, you know that you are one of the greatest bands of all time. 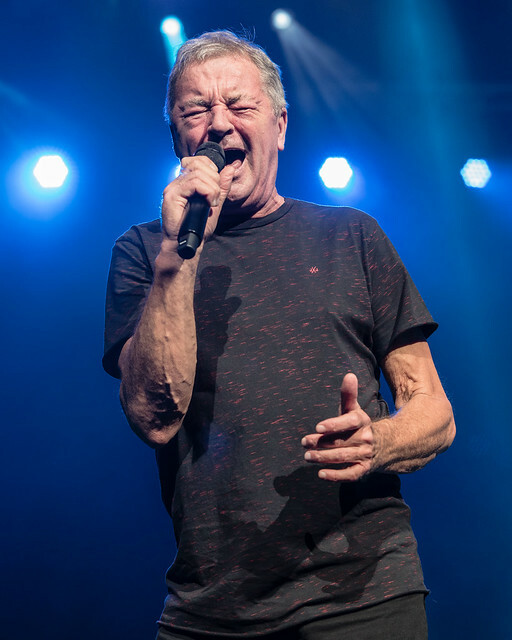 Ian Pace, Roger Glover, and Ian Gillan have been long time members of the band from the beginning and are still amazing musicians. 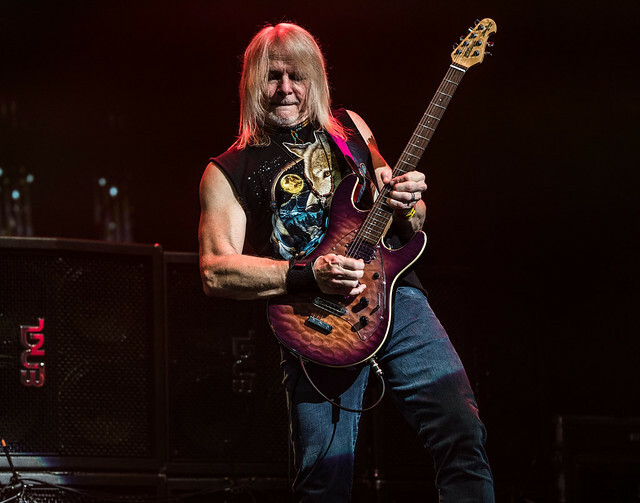 Steve Morse and Don Airey round out the current touring lineup. There have been many lineup changes over the years, but bringing some of the originals together with the other guys really makes it a treat to see them play. A lot of bands don’t have any of the early members or original members, but this lineup gets us as close as we can probably get at this point. The guys sounded great. It is always impressive when you see real musicians who learned to play in a time where you have your instrument and your amp and that was it. None of the computer based tools that are out there. These guys are old school. They had an open stage, no monitors cluttering up the front of the stage, their instruments, and their skills to create music. I was impressed with just the coolness of these guys and how great they sounded. You might even think they have done this once or twice before. The really nice thing for us media types there shooting this show was that their first three songs took about 20 minutes. We usually get five or six minutes in the pit to get our shots, but we were in there so long that we were not sure if it was two or three or six songs that they had played. It was great to be able to take your time and enjoy the show and get some beautiful shots from the pit. I give a big thanks to the guys for allowing us that much time. Priest and Purple both gave us a taste of the music they created over their long careers. The catalog that these guys have compiled over 50 years is unbelievable. This is why they are the influencing forces that they are. Their skills and dedication to their art is unmatchable, especially considering the state of popular music today. 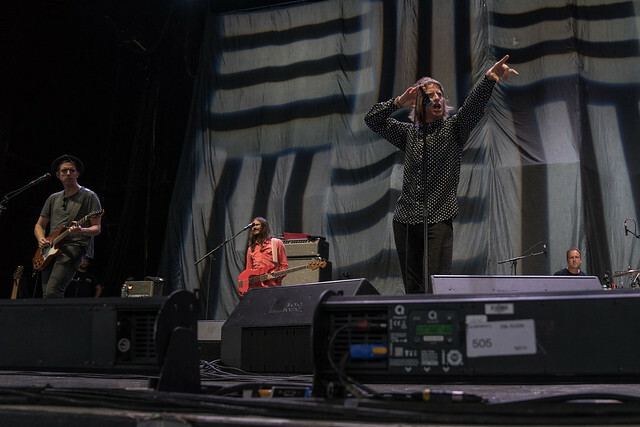 They have survived and been successful when other bands from their same era have disappeared from the radar. How does one manage to stay relevant? I think it is simple. What you see is what you get. The bands are true to themselves and true to their fans and do not try to be something they are not. I appreciate the honesty of what they do, their music, and not creating an image of what someone else thinks they should be. They never have wavered from this philosophy, and we all love them for it. If you like metal and rock music, no one does it any better than these gentlemen. Born in a small town in Western North Carolina, exposed to the wonders of the world at a young age through stories, words, and pictures. I have fond memories of flipping through Life Magazine to see the iconic images of days gone by and the exotic locations that only a National Geographic photographer could take me. Of course having my grandmother by my side giving commentary of how she met Mohammed Ali and where she was as Kennedy's car made that slow, fateful turn onto Dealey Plaza gave texture and substance to the pictures. Since then, my feet have left imprints in the soil in places I could have only once dreamed of. I have seen beautiful children smile in the dusty landscape of SW Ethiopia. I have walked the streets of the French Revolution. I have discarded my shoes to enter ancient Buddhist Temples in Thailand. I am always in pursuit to uncover new information, soak in new cultures, meet new people, and discover new music that can stimulate my imagination. I am on a lifelong journey, still searching for that ultimate experience. The goal of my photography and writing is to take you with me on my quest. If you are unable to be there with me, I want you to be able to immerse yourself in my words and pictures to help share with you an understanding of what it was like to be present in that small moment in time with me. Playlist: Hurricane Florence is coming! New Music: The Smashing Pumpkins Announce First LP in 18 Years.